In today's fast-paced environment, companies have to innovate and adapt to stay relevant. Large, cumbersome companies are being outmaneuvered by small, independent teams that are able to make and implement decisions quickly. With so much riding on these types of teams, it is important for them to be cohesive and effective. Effective team interactions require character strengths. The Team Agility Predictor provides a metric to measure a team's effective and ineffective behavior patterns so that team members have the information they need to act as a more cohesive unit. Increase the velocity of productivity and innovation quickly. Team climate is easy to change, whereas, organization culture is slow. Metrics and data increase attention by team members. If it gets measured, they attend to it. Helps team leaders understand the stage of development the team is in, so you can coach them. Purchase a one-year subscription to Tilt 365 Team Agility Predictor. Invite the leader or sponsor of the team to complete the assessment of the team's climate. Invite all of the team members in the group to weigh in on the team's climate. Invite key stakeholders to weigh in on the team's climate. View the real-time results as they come in. Once enough people have responded, you can begin discussing results with the team. **We recommend also hiring a Master Tilt Team Consultant or Coach to help you develop your team or group. What are the strengths and weaknesses of your organization right now? Is your organization improving over time? Tilt data can be used for broader objectives than individual and team reports. Once Tilt assessments have become integrated into your company, we can use that data to create a variety of custom reports. The content of the report can vary from describing the individuals in the company (e.g. proportion of each True Tilt and Current Tilt across company and broken down by department), to exploring change in scores over time (e.g. are people becoming more balanced? ), to using predictive analytics to connect Tilt data with company outcome data. Contact a Tilt Research Consultant to discuss specifications for the analytics that best fit your company's needs. We will estimate the scope of work in our first hour with you and invoice for the project. Continuous, real-time feedback about how others see your character strengths and influence style - as often as you like, 365 days a year! How are you supposed to improve if no one ever tells you how you are doing? Rather than creating a "one and done" static report that dies in a drawer, the Tilt 365 Positive Influence Predictor operates as a live user-driven dashboard for an ongoing transformational experience 365 days year. This feedback tool is driven by you, so you become your own researcher and learn about yourself over time. Putting ownership for personal development in your hands allows you to change what you truly want to change. When you are motivated to change, it sticks. Asking for feedback can be an intimidating process so our web app and subscription model allow you to request feedback whenever you want over the course of a year. Many of our clients decide to gather feedback 3-4 times each year, sometimes involving different stakeholders, to optimize growth and positive influence. The comprehensive report compares your self-assessment to how others see you, indicating your top strengths, blind spots, hidden strengths, and much more. From this information, the report offers deep and personal, yet immediately actionable, insights. The interactive dashboard provides built in positive reinforcement and self-study. You can post your goals with friends and get positive feedback along the way. Tilt is based on a scientifically validated framework for leadership and positive influence. Bonus resources to help facilitate your development in our Knowledge Base and wiki are included. We're always looking into what's next, so we'll be providing you with free resources, insights, and tools on the latest trends in people innovation, including our "Weekly Challenge" tips focused on agility, balance, flow, and habit change. Purchase a credit for a one-year subscription to Tilt 365 Positive Influence Predictor. Invite others to observe how you are showing up in terms of 12 character strengths. Review your full report and choose one habit to change. Commit to studying about it and practicing a new habit for 30 days. Then repeat! Watch your positive influence expand and your career and relationships improve dramatically. Tilt 365 named Top 20 Assessment and Evaluation Companies for 2017, 2018 by Training Industry. The Tilt of members of a group or team collectively shape the team climate. 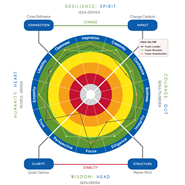 The Team Climate Profile is useful for predicting how a team may behave in terms of collective top character strengths, as well as how they will behave under stress. The report provides a compilation of the True Tilt Patterns of a group of individuals and how these patterns will shape the team's interactions. It is useful for improving the climate of a wide variety of teams: intact teams, cross-functional teams, self-managing teams, learning cohorts, and special project teams. In addition to improving individual teams, the Team Climate Profile can act as a catalyst for organizational change. Organizational culture is hard to change, but changing the climate of important teams can ignite an organizational shift. Team Climate can change rapidly with the right mindset and common language that people can remember. Have "key influencer" teams within your organization adopt this tool and witness the culture shift that unfolds. Team Climate Profile is the starting point for team culture change that creates the opportunity for rapid innovation. Create awareness of and appreciation for the character traits and strengths of your colleagues. Recognize what happens to your colleagues (and to you!) when you’re under stress. Purposefully shift as a team based on context. Create conditions for success and innovation for your team, your leaders,and even your entire organization. The Tilt Team Climate Profile is built on top of the True Tilt Profile, meaning your team members only need to take one assessment. 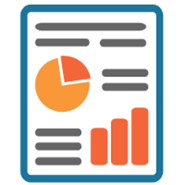 The same person can be on many Team Climate Reports, and teams can quickly update the report with the most current members without anyone needing to take additional assessments! This gives you the option to quickly analyze the Team Climate Profile of your entire organization, team-by-team or function-by-function, so you can understand where your Master Minds, Quiet Geniuses, Change Catalysts, and Cross Pollinators reside in your organization. Purchase enough True Tilt Profile Individual assessments ($49/each) for every member of the team, and purchase the Tilt Team Climate Profile ($99). Once underway, go to your Tilt assessments dashboard and click on the icon for your Tilt Team Climate Profile Report which will continuously update as members complete their individual True Tilt assessments. **For the best results: get certified in the tool, hire a certified Tilt expert to help you, or hire Tilt to do a workshop for your team! Science has shown that people are too complex to just be labeled a type. 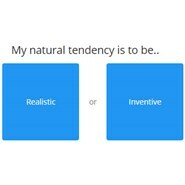 If you have taken any other personality test, then you probably thought, "This is just like me! Sometimes." We recognize that people adapt to their situations so the True Tilt Profile is designed to help you discover your natural tendencies and how they can look at different times. The report provides deep, personalized, actionable insights to help you understand, appreciate, and strengthen your true self from the inside out. Are you a Cross Pollinator, Master Mind, Change Catalyst, or Quiet Genius? Articulates not only what you do (patterns) but why you do it (motives). Results are reported on a holistic, validated visual framework that is memorable. Shows your pattern in comparison to other patterns to help you communicate with other people. Describes that you are not one "type" but instead adapt (or Tilt) to fit the situation. 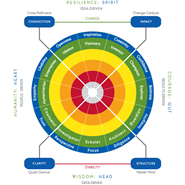 Gives you the tools you need to effectively use your strengths in different situations. So what's in it for you? The information you need to transform your life with increased productivity, well-being, and happiness. With the True Tilt Profile, you learn not only about your character strengths, but also why you work best with certain people and perhaps not so well with others. Your report will also indicate negative ways you respond to stress and how you can prevent those detrimental behaviors. Understanding your natural strengths and specific path of development will help you become more self-aware, productive and creative. 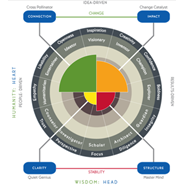 We created the True Tilt Profile to help individuals throughout organizations quickly rise above the inefficiency, destructive leadership, drama, politics, lack of accountability, scapegoating, and other annoyances present in many workplaces by using their preferred strengths more effectively. Purchase a credit for the True Tilt Profile. Take the quick self-assessment and read your snapshot of results on your device. Dig deeper by clicking into the Full Report that contains over 20 pages of content all about you. Build a development plan for evolving yourself over time. Watch your life and work outcomes begin to change. Tilt 365 named Top 20 Assessment and Evaluation Companies for 2017 , 2018 by Training Industry.